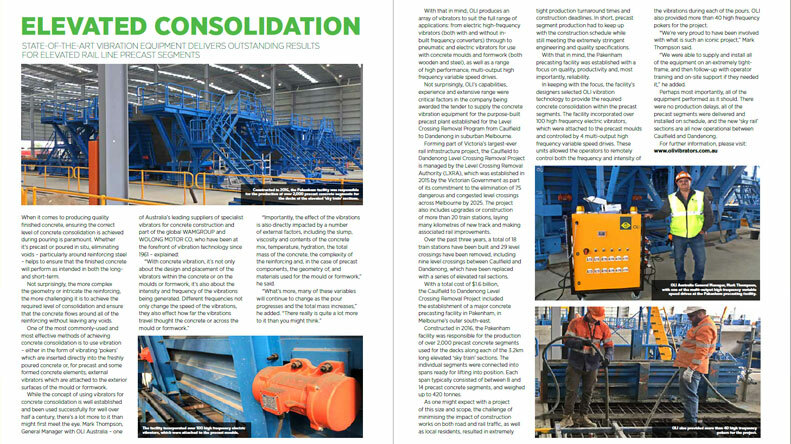 Mark Thompson, General Manager at OLI Australia, has been interviewed by the magazine “Construction Engineering Australia”. When it comes to producing quality finished concrete, ensuring the correct level of concrete consolidation is achieved during pouring is paramount. Whether it’s precast or poured in situ, eliminating voids – particularly around reinforcing steel – helps to ensure that the finished concrete will perform as intended in both the longand short-term. Not surprisingly, the more complex the geometry or intricate the reinforcing, the more challenging it is to achieve the required level of consolidation and ensure that the concrete flows around all of the reinforcing without leaving any voids. One of the most commonly-used and most effective methods of achieving concrete consolidation is to use vibration – either in the form of vibrating ‘pokers’ which are inserted directly into the freshly poured concrete or, for precast and some formed concrete elements, external vibrators which are attached to the exterior surfaces of the mould or formwork.